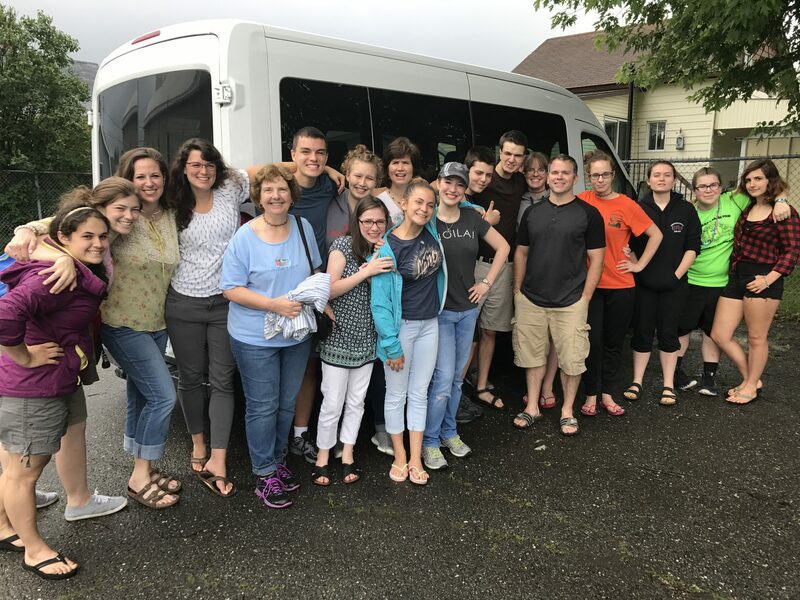 English for Kids Bible Camp (St-Georges) Team from the Presbytery of New York and New England. Sharon Knotts is 5th from the left. A wonderful, arduous week in St-Georges de Beauce, Quebec, is now history. It was a week of hard work, laughter, growth, prayers, singing, perseverance, storytelling, bonding, and giving of ourselves. Its preparation spanned 6 months, the travel 14 hours, give or take, 8 days of sleeping on mattresses on floors for most of us (but I had a couch), and several days of getting rested upon return. Why is it that members of this team go year after year? There is an amazing sense of God's purpose, guidance, and provision when we step onto His mission field. He holds our hands in such a fatherly way. He grants us deep and caring friendships with teammates and a bond with our sister church and the children we serve. He gives us joy to be carrying out His commandment. He allows us to be a part of giving the greatest gift that can be given to these children and their families. It is an honor and a joy that is humbling. Thank you for sending us out to share the love and the Gospel of our Savior Jesus Christ. Thank you parents for trusting us to take your children to a foreign country. Thank you to chaperones for being such a fine, patient, Godly example to our youth. Many thanks to the American and Canadian organizational teams for making this sacrifice of love a life-changing opportunity for so many. Thank you to the St-Georges de Beauce ERQ church for feeding and housing us and making us feel like part of your family. And, thank you to my team for giving so greatly of themselves and their time and energy. I pray that you have been blessed by this experience and ever carry on in efforts to share the Gospel. I am so proud of you and love you all most dearly. Please continue to pray for the salvation of these children and families that the good news they heard will grow in their hearts and they will listen to the Fathers call.